Hello my name is Paul, the site creator pictured holding a fat and well fed Susie. 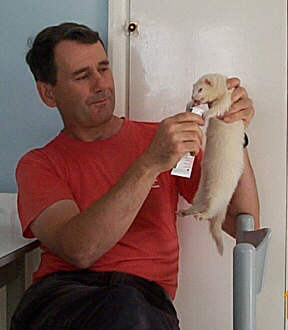 I have kept ferrets since the early 1980’s, without regret and had much enjoyment from these marvellous animals. My association with ferrets began by chance, when walking to work one morning, I spotted a cat hissing at a creature beneath a parked car. That creature was to be my first ferret. He (Bomber) wandered over and I picked him up and took him home. I was told by Mum “to get rid of it”, but she knew the ferret was likely to staying,. Later the ferret was given an old woollen jumper to sleep in, “just in case he got cold”. My find was advertised at the local newsagent’s, but no-one claimed him; that ferret , an ancient polecat hob, was the forerunner of many more ferrets to come. Me, holding fat ferret Susie.